The AISBackup Network Administration tool enables remote control of AISBackup over a network and can considerably reduce the cost of maintaining several installations of AISBackup for site license users. A shared network directory: for the distribution of information using file transfer. The AISBackup administration service: which uses TCP/IP to distribute information and files directly over the network. Using the AISBackup administration service enables AISBackup jobs to be controlled over the Wide Area Network where it may not be possible to use the network share method. View the results of backup jobs. View the status of currently running AISBackup jobs. Automatically distribute updates to AISBackup and the AISBackup Administration Service. Distribute AISBackup site license registration keys. Run a backup job on a remote PC. Schedule backup jobs on a remote PC. View the backup reports and job properties from a remote PC. Change the settings of a backup job and the files selected for backup on a remote PC. Remove a backup job from a remote PC. This option does not delete the actual backup. Make a new backup job on a remote PC. 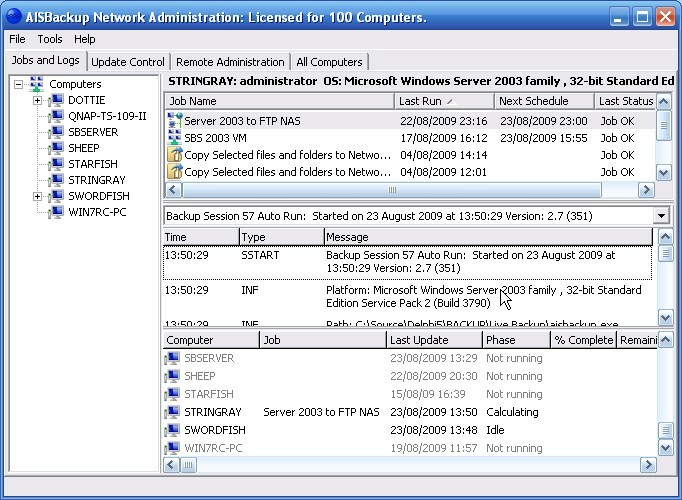 Host System: The AISBackup Administration Program runs on Windows 2000, XP, Server 2000, Server 2003, Vista, Server 2008 and Windows 7. The program has also been tested successfully using Windows 98. Client System (Service): The AISBackup administration service has been may be installed on Windows 2000, XP, Vista, Server 2003, Server 2008 and Windows 7. The AISBackup administration service is not supported on Windows 95, 98 or Windows ME. Client System (Shared folder): Any version of Windows where AISBackup can access the shared folder. Please note that Windows 95, 98 and Windows ME cannot access network drives on Windows Vista and above. The collection of AISBackup job summary reports. The current status of running AISBackup jobs. The automatic update of AISBackup and the AISBackup Administration Service. The manual update of AISBackup and the AISBackup Administration Service. Making and changing backup jobs. Viewing full copies of reports and AISBackup job properties. A trial version restricted to two computer is available for download. This version may be upgraded to the same number of site license keys that you currently own after payment of the appropriate fee. 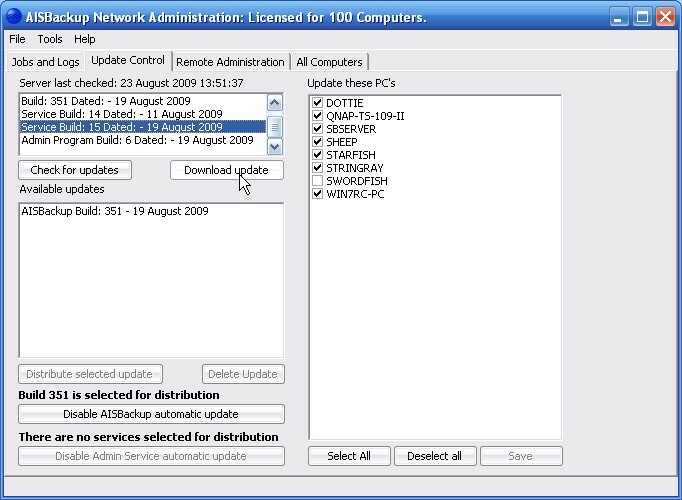 The AISBackup Administration Service only needs to be installed on PC's where the shared network drive options cannot be used, for example on WAN connected PC's. For security it is possible to share a key file between the AISBackup Administration Program and the PCs running the AISBackup Administration Service, this will ensure that no other installation of the AISBackup Administration program can access AISBackup on remote PCs ans Servers. The once the key has been generated it may be distributed using the Manage Remote System / Upload Security Key option.